North Scottsdale Organics partners with the community to provide healthy certified organic produce at affordable prices. * Provide top quality Certified Organic Food following all the necessary regulations for licensing. * Bring awareness to the community to support the elimination of unnecessary toxins in our food and body products. * Engage the community to make a difference through friendship, education and compassion. * Help generate vital funding to non-profits as they promote healthy food as a fundraiser. Shaun & Cathy Kalos started a certified organic co-op in 1998 to bring fresh & healthy produce to their growing family and the community. With 4 boys, they are most excited about helping parents realize the need for fresh chemical free food to nourish and build children's growing bodies. 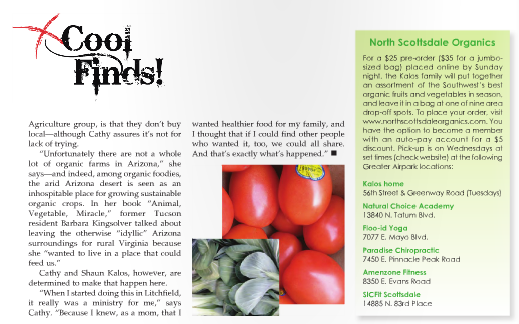 Litchfield Park Organics was established in 1998 and evolved in to a full Organic Market & Cafe. After they moved their family to Scottsdale they organized North Scottsdale Organics. Their endeavors have been acknowledged in several publications and they received a Best of Phoenix by the New Times creating a new category for the newspaper. 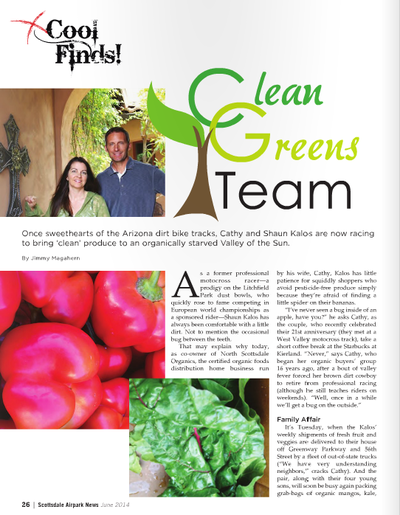 At Litchfield Park Organics, owners Shaun and Cathy Kalos stock a beautiful variety of organic produce from local vendors, and from California. Primary shoppers for fruits and veggies are co-op members, but for the rest of us, they also stock organic pasta, cereal, canned goods, milk, cheese and butter. Beef comes from natural (what a word!) cows in Goodyear, smoothies are all preservative- and chemical-free, and Cathy even makes 100 percent healthful takeout sandwiches in her spare time. Even when we're not hungry, this place makes us feel better just knowing it's out there. Aside from the farmers markets and CSAs, there are other alternative methods for snagging fresh produce in Phoenix, some of which feel daringly clandestine, like finding access to a moonshine-stocked basement speakeasy back in the days of Prohibition. 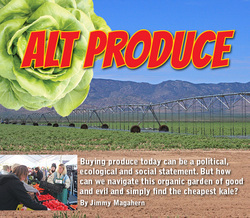 For 20 bucks, Cathy Kalos, owner of North Scottsdale Organics, will put together an assortment of the Southwest’s best organic fruits and vegetables, sourced from her network of leading organic farms, and leave it in a bag outside the doorway of her Scottsdale home (or at your choice of nine other locations) for pick-up. Creating a salad from the items you’ve grown in your backyard or on your patio is easy. It starts with your greens: romaine, spinach, and arugula are great bases for a delicious salad. Wash, slice up, and toss in tomatoes, snap peas, carrots, peppers, and onions. From the farmers market (or the weekly organic coop we provide right in our office: http://www.northscottsdaleorganics.com), add any of the ingredients you don’t have in your garden. Whisk together the juice of one lemon or lime (about 3 Tbs), ½ tsp Dijon mustard, and ¾ cup olive oil. If you use a blender, you’ll end up with an emulsified vinaigrette, or you can put that arm to work with a wire whisk. Add salt and pepper to taste, and enjoy! 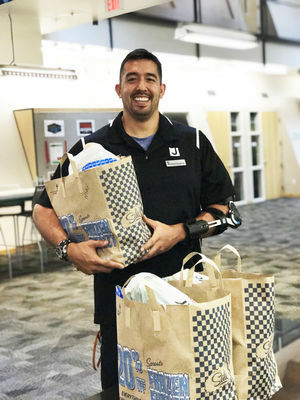 Eating healthy often involves a strong dose of organic produce, and the Valley of the Sun Jewish Community Center (The J) is making it easier for the area Jewish community to access such food offerings. The J has launched a partnership with North Scottsdale Organics to offer certified organic produce to community members. This service is part of an effort by The J to help support people in having a healthy lifestyle, said Andrea Quen, The J’s corporate giving director. Eating well starts with shopping well, so it makes sense to begin with buying the best quality foods, and that means organic foods, said Christi Christiaens, a certified clinical nutritionist and a certified personal trainer at the J. Each year, more than 1 billion pounds of pesticides are used in the United States, according to the National Center for Biotechnology Information. “These dangerous chemicals attack your immune and nervous system, they mimic estrogen, contribute to inflammation, kill the beneficial bacteria in your gut and can even change gene expression,” Christiaens said. Organically grown foods are more nutritious than conventionally grown foods, she added, and organic crops have lower levels of toxic heavy metals, pesticides, herbicides and fungicides. 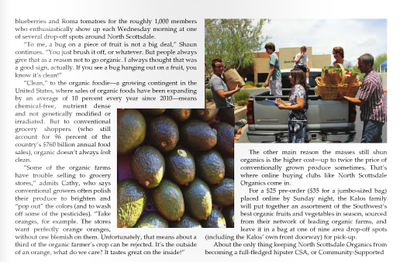 North Scottsdale Organics receives its produce from certified organic farms — primarily from Arizona and the West Coast — on Tuesdays. After being packed in bags and boxes in the morning, the produce is delivered later that day to several locations in the Valley, including The J at 12701 N. Scottsdale Road, Scottsdale. “A lot of these farms are the same ones that you would see at Whole Foods, but you’re getting [the produce] the same day it’s being delivered,” said Cathy Kalos, owner of North Scottsdale Organics. It’s often less expensive than what is at the store because “we don’t have the overhead that a grocery store would have,” she said. The cost is $25 for a bag and $35 for a box. Orders must be made by noon Mondays and are ready for pickup at The J on noon Tuesdays. No commitment or membership is required — if you want it that week, you order it that week. The selection changes weekly and is listed on the company’s website, or through an email list, so you are notified beforehand. The order is typically split evenly between fruits and vegetables, Kalos said. For example, this week’s selection included nectarines, peaches, red grapes, bananas, broccoli, Romano beans, green leaf lettuce, zucchini, purple carrot bunches, Tuscan melon (in jumbo and fruit boxes only) and yellow onions. Kalos said the bags are typically for one to two people and the boxes are for three or more. In the future, The J would also like ro provide recipes that use each week’s produce, Quen said (See recipe below). Kalos has been in the co-op business about 19 years ago, running an organic market and café in Litchfield Park for many years. She started North Scottsdale Organics in 2008. She noted that in recent years, people have become more aware of where their food is coming from and how it’s made.